With the possible exception of Archos, there are no big names in the Android tablet field right now. If you have a tablet running a Google-flavoured OS, chances are it’s from Shenzen, has a resistive touchscreen, and will have been superseded by a newer model by the end of this paragraph. Enter ViewSonic. They’re a display company with some fairly well-regarded LCD monitors, which should bode well for the display of their newly announced, previously-rumored tablet. Except for one thing : ViewSonic aren’t making it. The ViewPad 7 is simply a rebadge of the OlivePad, a 7”, WVGA, 3G tablet which apparently also works as a phone. It’s a strange notion, but both OlivePad and Viewsonic seem keen to impress upon potential customers that this device can actually make calls. The “Generic” look is very in right now. Other specs include a front-facing camera, half a gig of RAM, and a front facing camera for video calls. Coupled with a capacitive touchscreen, it sounds like an intriguing prospect until you discover that it has a 600 MHz CPU, the Qualcomm MSM7227 to be precise. That’s an ARM11 chipset, which sadly puts the ViewPad 7 firmly in the “Out of date” category. The ViewPad is slated to retail for “no more than £350 Inc Vat”. At roughly $530, that is not a price to inspire much confidence, and we suspect there will be better offerings at IFA this week. 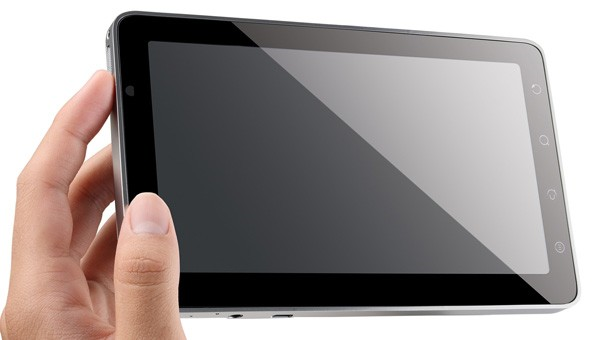 31st August 2010 – ViewSonic Europe ushers in a new product category to its portfolio with the introduction of a premium capacitive multi-touch screen 7" tablet. The ViewPad 7 is a world's first 7" Android 2.2 (Froyo) tablet with phone functionality, multi-tasking capabilities and front and back-facing cameras, VGA and 3MP, resolutions respectively. Within a lightweight, pocket-sized design, this device is ideal for anyone who needs a mobile connection to the world via email and video and wants to enjoy a wide-range of applications. With full 3G and phone functionality, a full size SIM card slot and integrated Bluetooth connectivity the ViewPad 7 will support instant messaging, text/mms messaging, VOIP and standard voice calls all in a single device. It features an easy to use familiar interface with a G-sensor that reorients the screen depending on how the device is held and access to the Google Android app store featuring over 100,000 applications. Additional features includes a Micro SD slot for up to 32GB of storage; Wi-Fi and 3G functionality for web browsing and USB connectivity. It also boasts advanced features including Assisted GPS and an office document reader, along with the capability for hand-written note taking. There is also an e-book reader, when combined with the crystal clear LED screen, makes the ViewPad 7 an invaluable travelling companion. Superior to other tablet offerings with resistive touch technology the ViewPad 7 incorporates a capacitive multi-touch screen and is a portable, easy-to-use and competitively priced device that will transform the way that consumers read, watch, listen to and interact with media in a mobile environment. "We are proud to announce another world first at Viewsonic. 3G phone functionality combined with dual cameras gives the ability for use of Android apps to use augmented reality or video calling on the move with the benefit of an excellent 7" screen" says Derek Wright, European Product Marketing Manager. "The ViewPad 7 is aimed at users who require the 'always on' connectivity they are used to from a mobile phone with a more agreeable screen size for longer term use." ViewSonic will be showing the ViewPad 7 at its stand at IFA 2010, in Berlin, Hall 14.1 stand 107. For details on the Viewpad 7 please visit http://www.viewsoniceurope.com/uk/.